Dominica, the Nature Island of the Caribbean, is located at 15º25′N, 61º20′W. Its 290m²/754km² are covered in luxurious, verdant forest. The varied flora and fauna are protected by an extensive natural park system and it is the only island to still shelter two surviving ancient Amazona parrots, the Sisserou (Amazona imperialis) and the Jacko/Red Necked Parrot (Amazona aurasiaca). This is the most mountainous of the Lesser Antilles Islands and visitors can explore hot springs, three freshwater lakes, the world’s second largest Boiling Lake, 50 fumaroles and five volcanoes. The highest point is the Morne Trois Pitons at 4,550ft/1,387m. Dominica is also home to many cetaceans – there are frequent sightings of a group of sperm whales who live in this area year round, and the visitor can also enjoy the antics of spinner dolphins, pantropical spotted dolphins and bottlenose dolphins. The name Dominica comes from the Latin word dies Dominica for Sunday, when the island was spotted by Christopher Columbus (3 November 1493). Before that, the Caribs knew it as Wai’tu kubuli meaning ‘Tall is her body’. 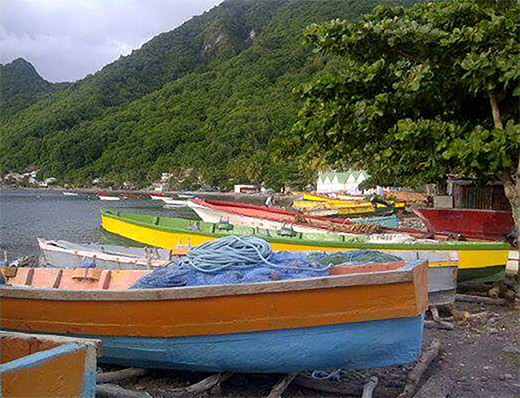 Fun things to do in Dominica: incredible diving and, of course, exploring its famous natural beauty, including hot springs, whale and dolphin watching, historical places of interest, and wonderful local crafts. The excellent buys to be found among local handicrafts include hats, bags and rugs made from vetiver grass joined with wild banana strands. The Carib Reserve Crafts Centre produces bags made from two layers of reeds that are buried in the ground to achieve a three-color effect and covered with a layer of broad banana-type leaf to make them waterproof. Visiting Dominica and wondering where to stay, what to do, where to eat and how to get around? We’ve got you covered with our list of hotels, restaurants, activities, car hire, shopping & more. Browse through for more details. ALDive & W.A.T.E.R Sports Inc. Discover Dominica through Hiking all month long! Hike Fest is brought to you by the Dominica Hotel & Tourism Association (DHTA), held annually in May. Typically there is a hike held on every Saturday in May. Hikes vary in difficulty. There is evidence that the island was inhabited in at least 3100 BC by the Ortoroid people from the South American mainland, and that they became extinct around 400BC. Later came the Igneri or “Arawak speakers” who settled in about 400AD. Their way of life was agricultural and peaceful with a well-defined culture. By 1400 this changed as a similar tribe, the Kalinago who became known as the Caribs, aggressively took over all the islands. They successfully fought the Spanish and French, and later British, attempts at colonisation but eventually succumbed in the 1600’s. After protracted tussles between the French and English, the island was ceded to Britain in 1763. Dominica became an associated state of the United Kingdom and in 1967 formally took responsibility for its internal affairs. On 3 November 1978, the Commonwealth of Dominica was granted independence and almost immediately, it became a republic.